Much marketing mileage has been made on the FBI SWAT and HRT teams’ decision to use M1911 pistols. The road has been bumpy and some reputations have been damaged and made on the way. Les Baer was the first to get an FBI contract, but there were problems. Matt Gish made the grade but didn’t have the production capability. Ultimately, Springfield Armory’s production capability won the day. This is how it went down. The Les Baer SRP was designed for the FBI’s Hostage Rescue Team (HRT) to replace their Wayne Novak-customized Browning Hi-Powers. Les and his team of pistolsmiths started with a Para-Ordnance P14-45 frame (.45 ACP/14rds) and added a variety of custom parts and touches, including Wayne Novak’s LoMount sights and Walter Birdsong’s Black-T finish. Unfortunately, Matt Gish, the pistolsmith who did most of the work on the trial SRP pistols left Baer to start his own shop, Gunsmithing Inc.. Baer tried to cut some corners on the delivered contract pistols, including the use of a different finish than the Birdsong Black-T. Once delivery began, there were lots of problems, mostly magazine related. In the end, pistolsmith Steve Nastoff was called in to correct the delivered pistols’ deficiencies. Only 75 SRP pistols were delivered out of the 250 ordered before the contract was canceled. Following this experience, the FBI rewrote the specifications to stipulate a single stack magazine, which opened up the field to a whole lot of gunsmiths. In the end, Springfield Armory got the contract because they could meet the demand and warranty. But they also had problems. Again, Steve Nastoff was bought in – he was there during the trials – and Springfield Armory switched from Wilson Combat to Metalform magazines. The FBI has now increased its order to 200 pistols a year. The Springfield Bureau Model was designed for the FBI’s SWAT agents to replace their SIG P226 pistols. David Williams’ team of pistolsmiths started with Springfield’s match-grade 1911 frame and slide, and added a variety of custom parts and touches, including Wayne Novak’s LoMount sights and Walter Birdsong’s Black-T finish. 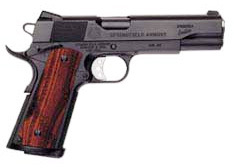 Only Springfield Custom and Professional Gunsmithing Inc. (Matt Gish) succeeded in passing the FBI’s harsh testing requirements, beating out Colt, Wilson Combat, and several other notables. The FBI specifications had stipulated that the pistol had to fire the Remington Golden Saber round accurately and this load proved to be a problem for several of the contestants. Springfield received the contract in 1998 because they were in a better position than Gish to supply the requested 500 pistols per year for up to 10 years. The FBI guns are warrantied to 50,000 rounds, both for the FBI and the civilian model. Professional Gunsmithing Inc. “…would have been chosen…” if it would have had the production capacity to supply the pistols on time and warranty them for the 50,000 rounds. Unfortunately, Springfield found that it is easier to hand build a few pistols to the FBI’s specs than to actually mass-produce them to fill the contract. Once again, pistolsmith Steve Nastoff was called in to correct the delivered pistols’ deficiencies. However, it appears that the FBI has not yet given up on the Springfield contract as they did with the Baer SRP contract. Thanks to Jake Martens of Indianapolis, IN who contributed significantly to this article.